One day, our autism consultant gave us a piece of advice about books and reading. She recommended that we choose books that we could not only read, but that connect with what our child is interested in, and we could act out in some playful way. 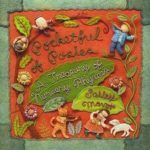 I realized that we already had several books that were a springboard to back-and-forth interaction and play with my children. This is a list of some of our family’s favorites, and what we did with them. Everybody likes pizza…and everybody likes grandpas who play with them. That’s what this book is about, and the game is so simple it’s easy to play as soon as you read the book. 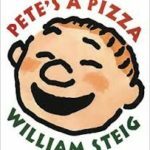 Pete IS the pizza, and his grandpa puts on the toppings (at Pete’s direction) and “bakes” him. What a great opportunity for sensory play!, We also made a pretend pizza making kit out of felt. William Steig has written a good many other books, most with more complex vocabulary, but all with lots of imagination (Doctor DeSoto, Grownups Get to Do All the Driving, Shrek, Sylvester and the Magic Pebble). Our kids loved most of the Dr. Seuss books. Other favorites included Green Eggs and Ham and Mr. Brown Can Moo, Can You? and Hop on Pop. They are just fun to recite, and fun to look at. Our kids also enjoyed playing with some Dr. Seuss finger puppets we found at a bookstore. 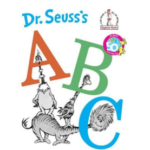 Most of the Dr. Seuss books are also available as interactive apps by Oceanhouse Media. 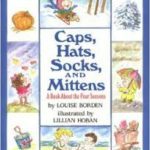 Usborne makes a lot of really good quality informational books for young children – flap books, beginner encyclopedia-type books, and dictionaries. Our son took this one out of the library so much we went and bought one – as well as the French dictionary – because he also enjoyed learning second-language vocabulary. 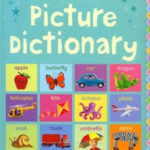 This is another great picture dictionary – and you may find Richard Scarry books catch your child’s interests. My son enjoyed looking for words together in books like this one. His stories are silly and the cartoonish images of animals in clothes are engaging and tell the story all by themselves. You can get toy playsets if your child enjoys imaginative play with figurines. 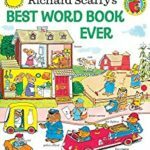 Richard Scarry’s ABC is another good one to try if your child isn’t into narrative stories. 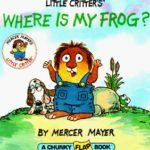 Mercer Mayer has written a large series of books about Little Critter and his family. 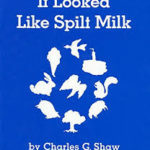 My kids were first interested in this book because of a computer program at their Grandma and Grandpa’s house, but they easily transferred that interest over to the books. This book came up over and over again every time we went to the beach, and led to them acting much of it out. Where is my Frog is part of a short series of flap books that was very appealing. This one tied into a strong interest – food. 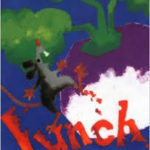 And this book is a very sensory exploration of various vegetables that a very greedy little mouse gobbles up. Other eating-related books we’ve explored include The Very Hungry Caterpillar by Eric Carle and Lois Ehlert’s Growing Vegetable Soup. A natural extension of these books is taking a trip to the grocery store to look at the produce section, or doing some food preparation and tasting in the kitchen – or simply playing with toy food. “In spring, dad cuts the grass and cuts the grass and cuts the grass…” This book gave my daughter words to talk about the changing seasons and the things families do together as seasons change around their home, and offers ideas for things to do together throughout the year – playing with leaves, sledding, mud pies and planting seeds, and playing in the sprinkler are some examples. I found the illustrations (they are embroidered!) in this book fascinating. My daughter did too…and she loved the rhymes as well. Nursery rhymes are an important part of childhood literacy, and this is a great introduction to them. With dolls used as illustrations, the book lends itself to simple dramatic play. This is one poem from A Child’s Garden of Verses, turned into a picture book. 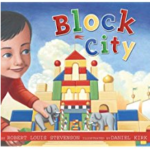 The boy in the pictures is building a city out of blocks and thinking about the people who might live in his city. We used to read it with our set of wooden blocks (sometimes in the tub!). Our son sometimes tried to copy the structures in the book, and sometimes we built differently….it was fun either way. Dreaming Up by Christy Hale, How a House is Built by Gail Gibbons, and Building a House by Jonathan Bean are other books for aspiring builders. 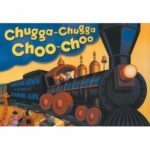 A simple train book with beautiful pictures of the toys going on a trip. Of course train books lend themselves to playing with trains – both building and driving can be lovely collaborative activities. We set up the train set a few times by ourselves in our house, but gradually the kids got interested. Other train books: Freight Train by Donald Crews and (for more mature readers) Locomotive by Brian Floca. 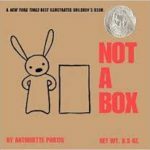 For children who are ready for symbolic play (pretending a real object is actually something else) this book and the author’s other effort, Not A Stick, provide many opportunities to stretch the imagination. It’s about all the things a box could really be…and an invitation to think of more. Quite frequently for a couple of years after we read this book we would spend some time on our backs in the hammock, looking at cloud shapes. It’s simply designed, with various shapes of white cloud on a deep blue background, inviting children to talk about what they see. And that’s it. You could take this idea into white paint or shaving cream on blue paper, as well. This book might make you want to draw. 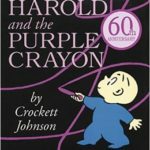 It’s a fantasy in which Harold finds he can draw his world – and has a few problems to solve with his magic purple crayon. We drew quite a few pies for moose and porcupines to eat…and this was the beginning of many hours of doodling on large pieces of paper together. A more sophisticated but similar adventure is Journey by Aaron Becker. I think our daughter might have wanted us to read this to her every night for about three years running. 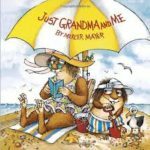 But it really is a fun book – a counting book and a hidden objects book in a funny story about a not-so-observant pet owner. 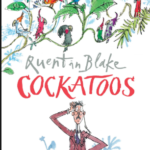 Quentin Blake has written a few more books (Quentin Blake’s ABC) but in our opinion, this is the best. Our kids’ Grandma gave us a bird puppet that COULD be a cockatoo, and we’ve had lots of fun with that. Hide and seek (with toys or people) is a natural activity to pair with this book too. 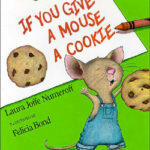 A boy offers a cookie snack to a mouse and one thing leads to another, right back around to another cookie. This is a great book to explore cause and effect. 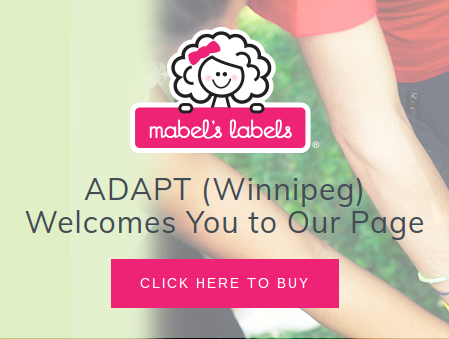 We were fortunate to be able to see the theatre version at Manitoba Theatre for Young People, and that seemed to ignite our children’s imagination. You could certainly act this story out as a crazy tea party. There are lots of sequels if your child likes this book. 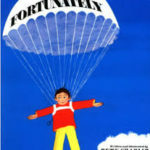 Fortunately by Remy Charlip is similar in that it balances good and bad events in a silly adventure. It’s a good introduction to the idea of problem and solution, which you could talk about as events unfold through your own day. Want more? Check out Part 2 of this book list. What books are your child’s favorites? Feel free to share in the comments below. The Hanen books More Than Words and Talkability each have chapters about enjoying books and learning together through reading.